St. Therese is best known for her approach to spirituality known as the "Little Way", which has inspired holiness in many. She realized that she wasn't meant to do great heroic deeds. Her calling, instead, was to serve the Lord with great love in her daily errands and sacrifices, offering up to God her sufferings and her smallness. 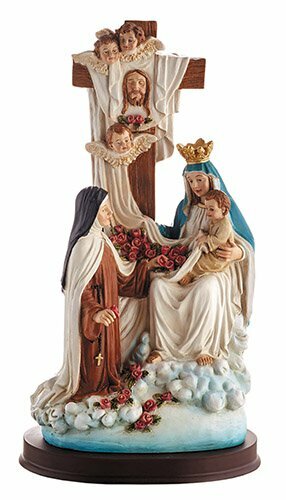 This statue is highly detailed and shows the true love St. Therese had for the Blessed Mother and her Son. Comes on a wood base.